Catholic News World : 50th Anniversary of Encyclical Humanae Vitae - US Bishops Statement -"....the beautiful truth....Marriage reflects the love of God..."
50th Anniversary of Encyclical Humanae Vitae - US Bishops Statement -"....the beautiful truth....Marriage reflects the love of God..."
WASHINGTON— In honor of the 50th Anniversary of Blessed Paul VI's papal encyclical, Humanae Vitae, Cardinal Daniel N. DiNardo of Galveston-Houston and President of the United States Conference of Catholic Bishops (USCCB), has issued the following statement. Originally published in 1968, Blessed Paul VI's letter promotes the whole human person in the context of marital love that respects both the spiritual and physical dimensions of man and woman, which is faithful, generous, and life-giving. "Fifty years ago, today, Blessed Paul VI issued the Encyclical Humanae Vitae. In it, he reaffirmed the beautiful truth that a husband and wife are called to give themselves completely to each other. Marriage reflects the love of God, which is faithful, generous, and life-giving. Through their vocation, spouses cooperate with God by being open to new human life. Blessed Paul VI, who bore the criticism of Humanae Vitae with charity and patience, courageously affirmed that when we love as God designed, we experience true freedom and joy. He has also been proven correct in his warnings about the consequences of ignoring the true meaning of married love. On this anniversary, I encourage all to read and prayerfully reflect upon this Encyclical, and be open to the gift of its timeless truths. 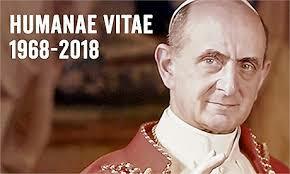 We wait in joyful anticipation for the canonization of Paul VI in October." For more information and resources on Humanae Vitae, please visit www.usccb.org/HV50. Rare Video of Pope Paul VI - Blessed Pope Paul VI spoke in English about the preparation of his encyclical "Humanae Vitae" during his general audience July 31, 1968.